inen scarves have been something of a revelation to me. I confess I’ve never invested much money in scarves in the past, but the nice ones I do have are all cashmere. There didn’t seem to be much of a choice really – scarves were either cashmere or wool, and both were too heavy to wear in the summer. But it’s only difficult to explain until you’ve worn one. Like the best summer fabrics – silk being another good example – linen is cool against the skin in warm weather, but provides greater warmth than you’d think when the temperature drops. So it’s perfect for leaving the house on a hot day, knowing you’ll be out after nightfall. Just wrap it a little tighter around the neck when the evening comes. Drake’s has a fantastic a range linen scarves, which I’d highly recommend. But make sure you pay attention to the different blends and weights. My first purchase was a small, green gingham check in washed linen. A lovely piece of cloth and the colour was fantastic worn with browns and creams. But it was rather large – 70cm by 200cm. It was referred to as ‘oversized’ and ‘extravagant’ in the description. So it was my own fault really: I didn’t read any of the text, let alone the numbers. The scarf is great, but my wife will wear it more than me. She’s not complaining. If only I could have contrived to present it as a present. Determined to find my perfect linen scarf, I visited Drake’s during an open day to look at the rest of the scarves first hand. 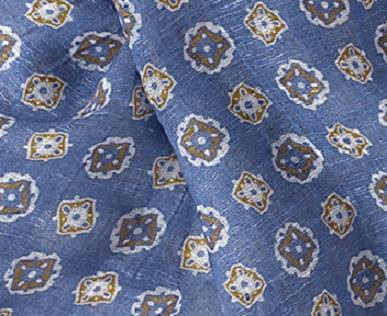 Immediately, I alighted upon a washed-indigo linen with a handblock print in cream and brown (pictured). Although the size was the same as the gingham, the linen was blended with modal (48%) and silk (9%) and lighter in weight. As a result, size was less of an issue: even doubled up it wasn’t as thick as the pure linen. In the end, a very satisfying outcome – particularly as I bought the sale in the Drake’s summer sale, which is still ongoing – but I’ve learnt a lesson on sizes and cloths in scarves. You can follow the discussion on A lesson in linen scarves by entering your email address in the box below. You will then receive an email every time a new comment is added. These will also contain a link to a page where you can stop the alerts, and remove all of your related data from the site. I recently purchased the pictured scarf, but in red…it reminded me of the bandana I wore as a kid playing ‘cowboys and Indians.’ It feels gorgeous, although I imagine my wife will wear it more than me.